I don't know about you, but I get this weird satisfaction from using things up. Like, no joke. Whether it's cleaning out the fridge, squeezing the last bit of my face mask out, clearing things out, whatever — I frickin' love it. My skincare routine also changes pretty often depending on the condition of my skin, the seasons, and what products I have on hand. I have a ton of beauty products that I tried to use up, a ton of samples, and some products that were sent to me for free or given to me as gifts. Most of these products I bought myself, however, because I love trying new beauty products. I try to go for all natural products; I truly believe that what you put on your body is just as important as what goes inside it. Notes/reviews at the very bottom! Note: My skin type is combination/oily — overall pretty oily but there are dry patches as well. It used to be acne-prone; now I just tend to get blackheads. Note: My hair used to be super dry from my years in the pool, but now it hasn't touched chlorine in so long that it's fairly healthy. I have thick, long, dark hair that can get oily but I have a dry scalp. Note: One thing that still hasn't changed from my years swimming is my dry skin. Whatever I put on my skin, my skin soaks up immediately. Honestly, I've been trying to get more on the "clean makeup" train. Even though a lot of products at Sephora or at department stores are $$$, they can still (and often do) contain skin-irritating ingredients. I don't wear foundation super often, but I do find that a light dusting of BareMinerals doesn't clog up my skin too much and looks natural. You can see the ingredients here — they're literally all minerals. All of the products I've used up I would definitely repurchase; in fact, I have a couple of mini NARS lip crayons in my various bags (anyone else do this?). Some big things to look for when checking ingredients: PEGS, parabens, some oils (depending on your skin type — especially mineral oil), and artificial fragrances and colors. The Orlando Pita Argan Oil worked fine, but I much prefer Josie Maran Argan Oil or just using straight up coconut oil. Shampoo and conditioner-wise, I would repurchase (and have repurchased) both the Seaweed Bath Co. and Living Proof brands. I've noticed that the more care I give to my skin, the better it gets. Two big factors are taking the time to do a face mask and to exfoliate — the more often I do that, the clearer my skin gets. I love all the Maria Akerberg products that I get from my local spa; they don't irritate my skin and are all natural and organic. I also loved the Tata Harper Resurfacing Face Mask; I would use that in the mornings if I had time, whereas I could use the Maria Akerberg Gentle Face Mask as a spot treatment at night. Cleansing-wise, I was ambivalent about all the ones I've used up — they were fine, but I'm not repurchasing. 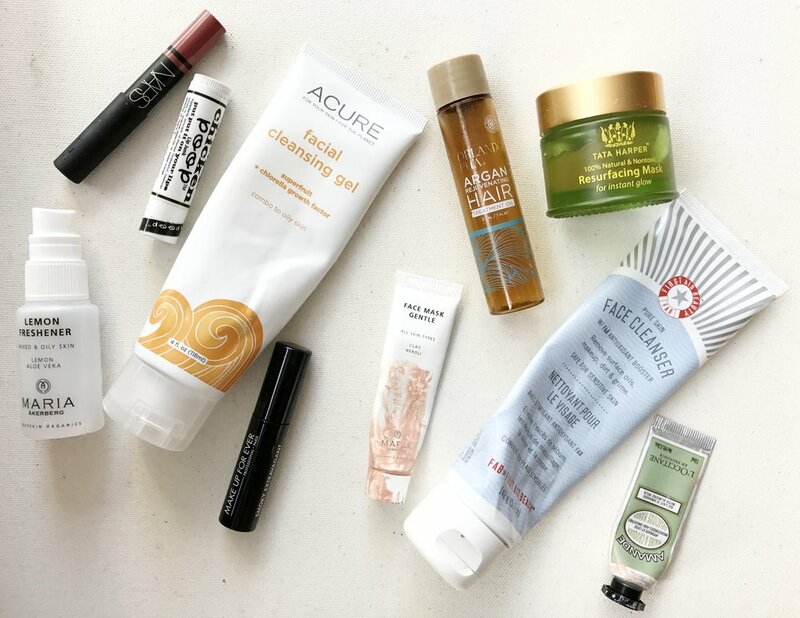 Proof that your skin can change — I used to only use the Fresh Soy Face Cleanser because it helped my skin so much when I first entered college, but wasn't doing the trick anymore. I would (and will) repurchase everything I used up under this section, with the exception of the Palmer's. I loved that the The Seaweed Bath Co. Detox Cellulite Soap was exfoliating; the cream that it came with was hydrating without being too heavy. Whether or not it reduced/prevented cellulite I can honestly not say. I'm a rollerball junkie, and the NEST ones were both some of my all-time favorites. They're pricey, but a little goes a long way. I used one for the spring/summer and one for the winter. Note: WHEW. Long post. I'd love to hear YOUR favorite products, if you've tried any of these, and any recommendations you have!